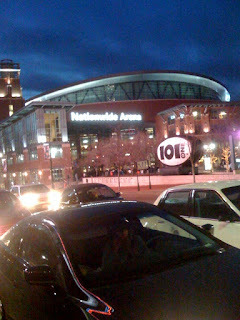 Bill & Lisa's Sporting Life: Jackets Win - A New Experience! 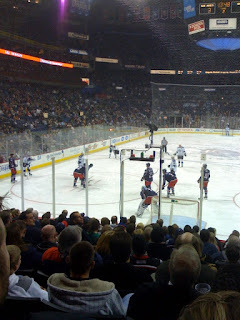 When the Columbus Blue Jackets entered the NHL as an expansion franchise in 2000, I made an arrangement with a Dayton businessman in which I bought his four section 109 lower bowl tickets to 9 games for the Blue Jackets' inaugural season. This was a leap of faith, because at best I was a casual hockey fan. But the money was put down because I was enthused that a major league sport was debuting in our fair city. And Lisa and I (as well as my law partner Alan Berliner who now shares our seats) have continued to buy these tickets through eight desultory seasons in which the Blue Jackets never achieved a winning record nor sniffed the playoffs. 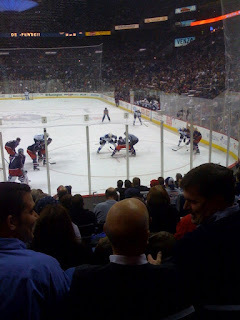 Despite the Jackets' lack of success, we enjoyed the action; there is no faster-paced sport outside of auto-racing. But notwithstanding this faithful support of the club, Lisa and I never developed that strong bond with the Jackets or hockey that is associated with rabid fans. Aside from borderline superstar Rick Nash, the departed enforcer Jody Shelley and the occasional goaltender, (remember Ron Tugnutt) the names of the players tended to slip our minds. I am sure the not so subliminal reason for our holding back a deep emotional commitment is because we have been burned so many times by blood pledges of fealty to numerous hapless Browns, Cavaliers and Indians teams. For the first time, the possibility of a Jackets playoff appearance looms. The disciplinarian no-nonsense approach of coach Ken Hitchcock coupled with the phenomenal play of rookie goalie Steve Mason has paid big dividends. Lisa and I still do not comprehend all the ins and outs of hockey, but even an untrained eye can detect the team's improved passing, checking, aggressiveness , and consistent goaltending this year. Wednesday March 3rd, the Jackets hosted the Los Angeles Kings, another contender for a Western Conference playoff berth. 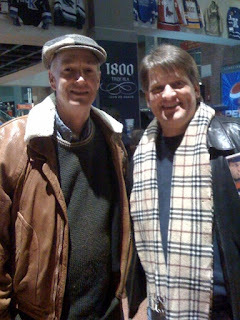 We ran into our great friend and fellow sports fan, Chuck Ticknor who graciously agreed to be photographed for the Sporting Life. The Jackets evidenced the pluck and grit that has characterized the 2008-09 team in prevailing 5-4. Previous clubs would have folded after the Kings' three goal onslaught in the second period which put L.A. out in front 4-3. Overcoming a rare subpar outing from Mason, the Jackets rallied. They peppered the Kings' goaltender with an array of shots. This strong offensive output featured two goals and an assist from Manny Malhotra. The winning goal came on the sweetest cross-ice pass imaginable from Rick Nash to Malhotra. The pass was so pure that I might have been able to knock it in assuming of course that someone propped my nonskating self in front of the Kings' goal mouth. Lisa and I have been good luck charms for Malhotra who always scores when we attend. Unfortunately there does not seem to be much of a market anymore for good luck charms. The most successful such "charm" in sports history is the half-wit Charles Victor "Victory" Faust who served as the good luck mascot for the New York Giants (baseball) in 1911. Faust was reportedly told by a fortune teller that he would pitch the Giants to the pennant in 1911. He then presented himself to the Giants Hall of Fame manager John McGraw in St. Louis where the Giants were playing a series with the Cardinals. Faust revealed the soothsayer's predictions to the superstitious McGraw. In the Giants'next game, McGraw allowed Faust to sit on the bench and the Giants won. The Giants left town without Faust and the team collapsed into a losing sreak until Faust showed up at the Polo Grounds in New York and a desperate McGraw gave him a uniform. With the simpleton Faust in tow, the Giants sprinted to the pennant winning 39 of their last 41 games. McGraw even let the no-talent Faust (he threw nothing but straight slow balls with an odd windmill motion) pitch in two games after the pennant was clinched. When Faust left the team two years later, the Giants stopped winning. Regardless of whether our services as lucky charms are fully utilized, the Jackets' spirited play has us fired up and we have jumped headlong on to the team bandwagon. Now, we even know the players. There is a palpable sense of anticipation in the Nationwide Arena that good things are going to happen even when the Jackets fall behind. Get ready for an entertaining stretch drive!